All Educated Ones/Scientists, who really want to get the inside scoop on the workings of the earth and become tops in your fields, listen to Enoch's account concerning the 'exact workings' of this world's as God designed the days of the seasons, the 12 portals that bring the various weather variables, , trade wind routes and those of us who are not experts at all, should be fascinated by this first hand account given by God to Enoch because it can only add to our own admiration of His Greatness. There is no way this book is not Divine. About the 2 hour mark, it speaks about how the earth began to die and life shortened because of the unrighteousness that had begun. Then you get a real challenge when you hear the descriptions of men being referred to as animals. You must listen carefully to learn who is whom such as the White Bull, the Red and the Black Bulls who begat young of various colors. Wonder where the races came from? 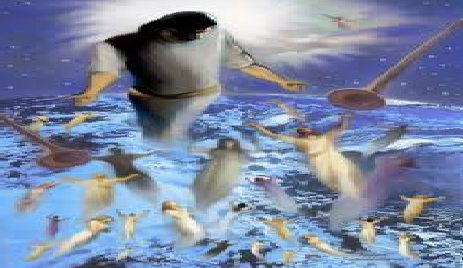 Listen carefully and you will hear verification of the Fallen Angels that came down upon earth and how they are referred to as the wolves, lions, bears and other animals of the wild and what were produced because of their mating with the heifers. Soon, the animals left their stalls and began to do unspeakable things. This is the Old Testament account that led to the days of Noah. It speaks of the White Bull that had 3 sons, one white like himself, one red and one black. These are referring to Noah and his sons. The Birds of Prey are mentioned such as the Ravens & Kites with the Eagle as the leader over the others who will devour the bones of the Unrighteous. We know that the Eagles represent the Illuminati of today. Also, you will come to the Idle Shepherds, who receive strong warnings because they and their associates have delivered the sheep over to the High Tower and did nothing to sound the warnings. This sounds like today in which great apostasy is taking place. In fact, when I think of High Tower, it comes to mind the recent World Tower constructed from the Twin Towers that were destroyed. There is a message in the destruction of Twins to make One by merging the DNA of one with the other and as Lady Gaga tells us, we have a Race within a Race. Enoch was way ahead in all of what is to take place. I can't wait to get to more but for tonight this will have to do. Again, take time to listen to this Ancient Book of our world of yesterday, today and tomorrow.